Alas after months of sweltering heat, winter season is setting in! It’s December already and those who are familiar with Lucknow’s weather know that this year the winter season seems somewhat delayed. There was no sudden onset unlike a couple of past years. That helps as it gives people the time to gradually adjust to the changing weather, as compared to drastic changes that have a lot of ill-effects on health and safety. Winter brings out the best in Lucknow. All of Lucknow’s scenic historical monuments and parks appear all the more beautiful as compared to summer season when the harsh sunshine prevents people from even venturing out during the day. In winters, you can try out a new look with what you wear and how you look without worrying about anything. A number of cultural events are held around the festive season that begins with Diwali and goes on till the new year celebrations. Apart from personal re-unions or weddings, Lucknow offers a lot more to do in this season and how can it not be about food in Lucknow. From the seasonal fruits to yummy delicacies, the winter comes to treat the taste-buds of food-lovers of Lucknow. Makkhan Malai (Sweetened Butter) is a melt-in-the-mouth dessert that is claimed to have originated in Mathura, but this delicacy enjoys enormous fanfare on the streets of Lucknow none the less. Lucknowites wait to savour this seasonal dish as soon as it is available when the intense summer heat relents and mellows down in the cooler months of the year. Vendors carry Makkhan Malai in large conical glass funnel shaped dishes and are traditionally partially draped with a red cloth. The creamy delicacy is made even richer in taste and flavour by adding saffron to it, thus giving it the trademark yellowish colour. Makkhan Malai is then topped with fresh finely chopped soaked dry fruits such as pistachios and almonds. Lastly, with this being Lucknow, how can we not gracefully envelop a dessert with ‘Chandi ka Warq’ (coating of ultra fine silver sheets) to make it look royal and even more desirable? The love for peanuts or Moongphali can be appreciated due to the fact that peanuts, date back to around 800 B.C. and people were so fond of them that peanuts have been found in excavations at the archaeological sites in Lucknow. It is believed they played an important role in the diet of the Aztecs and other Native Indians in South America and Mexico. Moongphali is another winter delicacy in Lucknow. Although it is available the world over, in Lucknow it is sold roasted which is an integral part of its taste. Traders usually roast moongphali in sand in a deep pan or fire up some coal and store in a clay pot or ‘matki’ and the place on top of a pile moongphali in their carts. It ensures that the moongphali underneath the pots gets roasted by the simmering clay matki. These moongphali stalls can be spotted in every nook and corner of the city. As the winter season starts, you can find roadside vendors selling Singhara (Water Chestnut) grown is ponds and lakes around the city. Some people eat them raw while some like them boiled. It is quite common to see a kerosene stove kept by the side of a Singhara cart where you can find singharas soaking in boiled water. Gajak or Gazak is also a popular dessert in Northern India, available in the winter season only. Gajak is a dry dessert made from sesame seeds and Jaggery or ’til/tilli’ and ‘gud’, as they are known as in Hindi. They are quite similar to cookies. The sesame seeds are churned in sugar syrup and are laid out in thin layers and have a comfortably long shelf life. The preparation is quite meticulous, and it can take almost 10–15 hours to prepare up to 5 kilograms of gajak. Usually when you hear carrot halwa or gajar ka halwa, you picture it with the usual red carrots but in Lucknawi winters, Awadhi cuisine has introduced us to a more lip smacking Kali Gajar ka halwa or black carrot halwa. It is a specialized dessert that very few shops even in Lucknow make like Radheylal and Keshav Ram. This Halwa is rich in ghee and Khoya/Mewa, and if Lucknowites are to be believed, which in matters of food you should, kaali gajar ka Halwa outdoes its laal gajar counterpart and is also best served hot, making it irresistible in winters. Although Lucknow is famous the world over for its own cuisine, it has heartily adopted this Kashmiri delicacy. 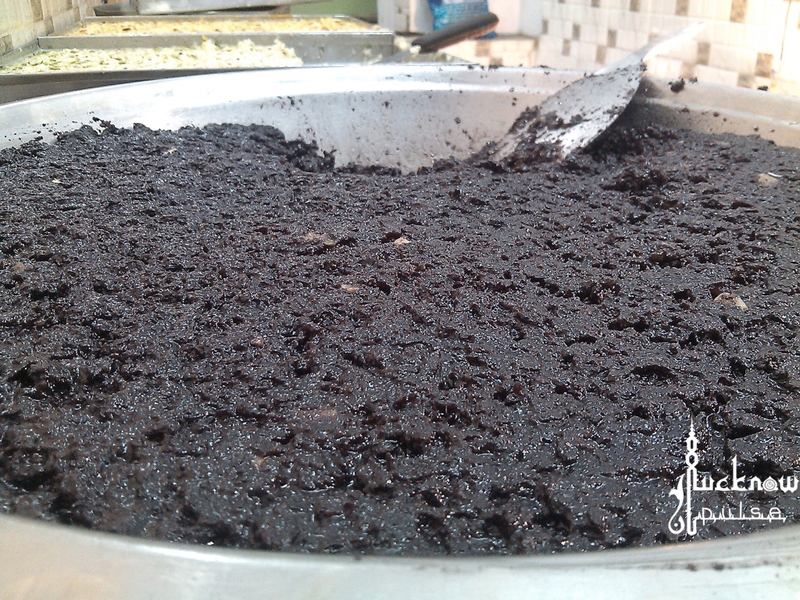 Today it’s synonymous with Lucknow’s winter and is available at throughout the Old City, especially Akbari Gate. The Meticulous preparation of Kashmiri chai is what sets it apart from regular tea. Like regular tea, it is made with milk but unlike regular tea, cardamom, salt, crushed almonds/pistachios/cashews or all three mixed are used and tea leaves are boiled with some baking soda as well. The whole process gives Kashmiri chai its distinctive pinkish color and salty taste. It is served piping hot which is one of the reasons why it’s so popular in Lucknow’s chilly winters. Not to forget this in the winter! Although available year round since the year of 1890 with die hard fanfare irrespective of the weather, the piping hot nahari and just-out-of-the-tandoor kulchas have no competition when it comes to winter specials. Especially the ‘Paya Nahari’ which is actually well known for its efficacy for warmth almost a remedy to avoid the chills! A must-not-miss of Lucknow winters. The winter truly does bring out the best in Lucknow. The weather makes the city almost as cool as a hill station and as usual, a heaven for foodies in Lucknow! Dear Pravin, You must visit Lucknow soon.